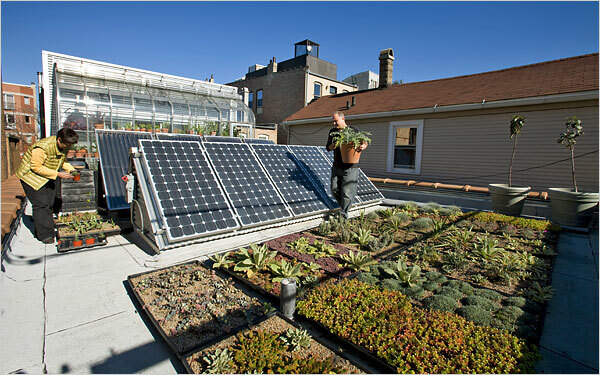 This house in Chicago designed by its owners; Frances Whitehead and her husband James Elniskis, uses many aspects of “green technology”. The outside is covered in corrigated steel and zinc siding to retain heat. The interior uses a variety of different energy efficient features. The floor in this living room is “radiant heated“. I think that this is a great winter solution for the cold marble floors here in Israel. 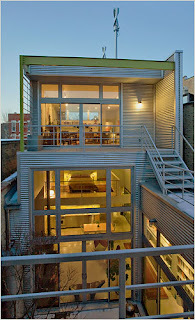 *I love the simplicity of the design in this loft like space. The kitchen is a wide open space with vibrant color on the walls. The color choice here reflects light and connects nature elements from the outside with the inside space. Chartruse green is a good choice for the kitchen, this is one room that can handle a lively color like this. I see that they also have accent pillows that work to “tie in” the green color thourghout the space. 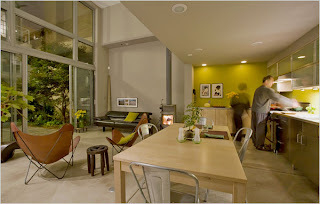 More green upstairs… This couple likes green even more than I do! Used as an accent on the one wall it works. 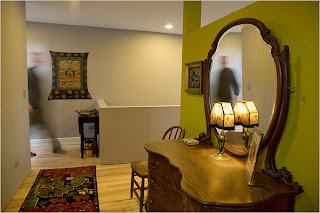 I really love the way they mixed old furniture with ethnic art. And finally, the roof! This garden is not the eating kind, it is here to divert rainwater from running off into the street. Wow, they thought of everything! Living in an apartment does not have to mean “no gardens allowed”. If you have windows, you can have gardens. This small addition is a “breath of fresh air” to any city dwelling. This is a photo of my small garden just outside the kitchen window. Every Tubisvat I replant the herbs and flowers and by Purim theyare bursting with color! Window box gardening is pretty simple. All you need is to find the garden center nearest you. Item list: brackets, windowboxes, soil and plants. Tip:Self watering systems can also cut out maintenance time but they are an added expense. 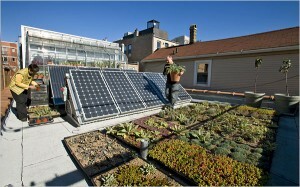 Rooftops are another option for the city gardner. I see this as an emerging “indoor- outdoor” trend. The method shown here is referred to as “container gardening“. This style of gardening is both practical and productive. The additional wall colors in the background add to the vitality of the garden here. 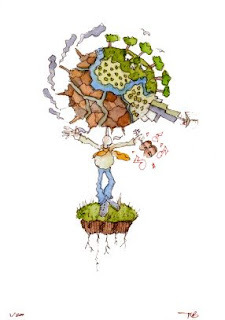 Environmental awarness is happening everywhere with more and more people joining the green revolution. 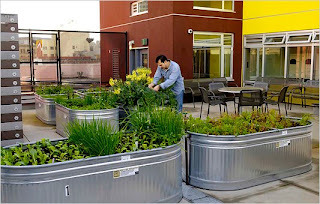 This rooftop garden not only looks good, it helps divert rain water runoff from the city streets and recycles it for use in non drinking water functions for the building. One good windowbox can lead to a million other gardens… so this spring, go green!